ZAGREB (Reuters) - Croatian President Kolinda Grabar Kitarovic has won many admirers for own performance at the World Cup final in Moscow, where she stood in driving rain at the closing ceremony, smiled and hugged every player from both teams. 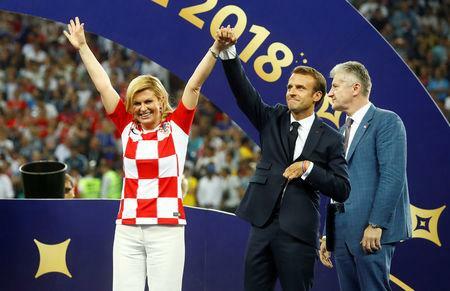 Grabar Kitarovic, clad in a red-and white Croatia football shirt, stood on the podium with Russian President Vladimir Putin and French President Emmanuel Macron when the medals were given to the players. Later on Monday, the Croatian capital Zagreb will stage a welcome celebration for the football team, which achieved the greatest success in the history of Croatian football, surpassing their performance 20 years ago when Croatia won the third place at the World Cup in France.